Jessica Sklar ’97 was “shocked” when she won an award for a paper that originally had been rejected. “If you think you have something good, you have to put in the effort to listen to the criticism and make it better,” she says. One was a math major at Swarthmore, the other was an English major. One of them is detail-oriented, the other likes to look at the big picture first. One teaches at an urban university in the middle of Detroit, the other at a tree-filled campus in suburban Tacoma, Wash. But what Elizabeth Sherr Sklar ’63 and Jessica Sklar ’97 have in common is more important than what divides them. This year the dynamic mother-daughter duo became the proud co-editors of the new book Mathematics in Popular Culture. 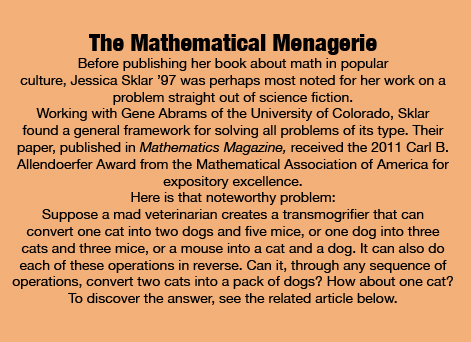 It’s a perfect blending of the talents of Elizabeth (an expert on the Arthurian legend in popular culture) and Jessica (who has written an award-winning paper on the whimsical Mad Veterinarian Problem—see sidebar). When Elizabeth Sherr was still an undergraduate, she married Swarthmore professor Lawrence Sklar, who studied the philosophy of science. After earning a Ph.D. in English and medieval studies, Elizabeth accepted a tenure-track appointment at Wayne State University in Detroit, conveniently close to her husband’s job at the University of Michigan. 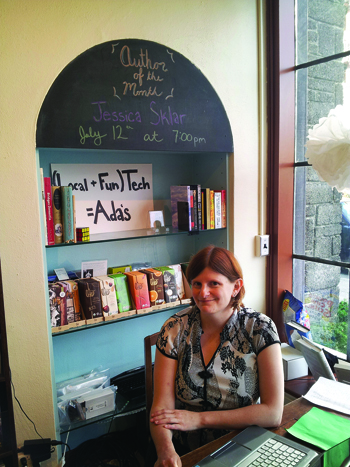 Jessica pulled off the difficult double major of English and mathematics at Swarthmore, then earned a doctorate at the University of Oregon. She now teaches at Pacific Lutheran University in Tacoma. 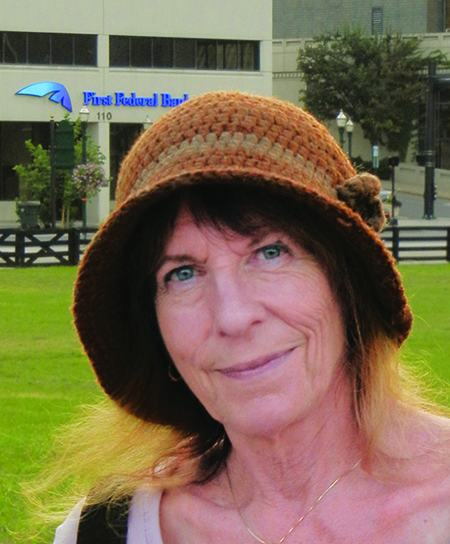 Elizabeth Sherr Sklar ’63, has done work on Arthurian legends. They didn’t have the least difficulty finding people to contribute articles. Jessica contacted some of her friends in mathematics, and Elizabeth spread the word among cultural theorists. Soon they were getting submissions from people they didn’t even know. The result is an amazingly diverse book, both topically and in points of view. It includes several chapters on math in the movies: The Matrix, Andromeda Strain, Good Will Hunting, Stand and Deliver, and of course Jessica’s own chapter on Saw. Other chapters focus, for example, on literature (War and Peace, Cryptonomicon), television (Lost, Survivor), Web comics (XKCD), and games (baseball, Dungeons and Dragons). Will they do it again? You can just about count on it. The two are already discussing a coffee-table book on mathematics and art. “I’d work with her again in a trice,” Elizabeth says. Solution: Were you able to transmongrify a pack of dogs?